Guyana closed off the second leg of the 2014 Inter Guiana Games in Paramaribo Suriname in grand style when they defeated Suriname in the last event, male volleyball, 3 sets to 1 in the process breaking a seven year jinx. Celebration Time! 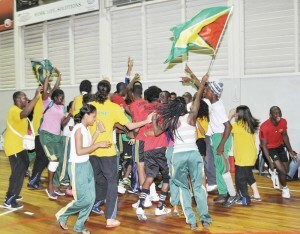 Victory achieved in the volleyball game, Guyana defeating Suriname after 7 years. French Guiana also join in. Urged on by their own fans and the French Guiana contingent, the Guyanese who won the first set 25-18 and gave up the second 17-25 ensured that the Surinamese who lost to French Guiana the night before three sets to two in a thriller were not going to celebrate as they swept the other two sets. The third set saw the Guyanese winning 25-18 to go two/one up. The home team was not short of supporters and ran up a six point lead in the fourth set but the determined Guyanese led by excellent all-round play clawed their way back to tie the score at 13, took the lead at 14 but the Surinamese evened things up at 14. That was to be their last hooray for the night since Guyana regained the lead at 15 and never looked back, eventually closing out victory at 25-17. The win sparked wild celebrations not only by the Guyanese players and fellow team members but French Guiana’s contingent who supported the Guyanese throughout the clash in Mashramani like atmosphere. Following the game was the closing ceremony which saw remarks by representatives of the three countries. Guyana’s Director of Sport Neil Kumar complimented the Local Organising Committee for a splendid job while thanking the Guyanese athletes and officials for a marvelous job overall. Kumar also complimented the Guyana Table Tennis Association (GTTA) for the confidence they showed in exposing less experienced players who rose to the challenge by winning the male and female gold medals. Guyana’s female volleyball team ended third while placing second to Suriname in Badminton. Chess was won by Suriname with Guyana second and French Guiana third. The Guyanese won the male and female table tennis with the host nation second in the females and French Guiana as the runner-up among the males. Guyana swept to victory in the male cycling while Suriname did the same among females while French Guiana won male football and Suriname, female.